December 25th is Christmas, the traditional day when Christians celebrate the birth of Jesus. This time of year, movies, TV shows, lawn nativities, music, and Christmas plays tell the story of the baby in the manger. Almost everyone knows this story. It's the story of Joseph, Mary, baby Jesus, the shepherds, and the wise men. But how many people realize the events of Jesus's birth were foretold hundreds of years in advance? That's right. Hundreds of years before the birth of Jesus, God foretold the place of the Messiah's birth. He also told us about many of the events surrounding His birth, including the exact window of time in which He would be born. When Jesus fulfilled these prophecies, they revealed His true identity to the world. Are your friends and family aware of this? If not, Christmas is the perfect opportunity to tell them about these prophecies and to share the Gospel with them. 1) His Place of Birth - Hundreds of years before Jesus was born, the prophet Micah revealed the birthplace of the Messiah - Bethlehem. He said while Bethlehem is only a small village, a ruler of Israel whose origins are from the distant past will come from her (Micah 5:2). The Book of Matthew tells us Bethlehem is the birthplace of Jesus. When the Roman Emperor demanded a census be taken throughout the empire, people were required to return to their ancestral towns to register. As a descendant of King David, Joseph was required to go to Bethlehem, taking his wife Mary with him (Luke 2:1-5). While they were there, Jesus was born in Bethlehem (Matthew 2:1). 2) The Miraculous Means of His Birth - Once again, hundreds of years before Jesus was born, the prophet Isaiah relayed a message from God to King Ahaz. In His message, God promised to send a miraculous sign. And what was the sign? A virgin would give birth to a child. Needless to say, this is something that had never happened before. Isaiah said the child would be named "Immanuel," which means "God is with us" (Isaiah 7:14). According to the Book of Matthew, Jesus fulfilled this prophecy as well. His mother, Mary, was engaged to be married to Joseph. But while she was still engaged, she became pregnant through the power of the Holy Spirit. Joseph considered breaking the engagement, until an angel appeared to him in a dream and told him the child was conceived of the Holy Spirit. The angel said to name Him Jesus because He would save people from their sins (Matthew 1:18-21). 3) The Details of His Ancestry - Almost two thousand years before the birth of Jesus, Jacob said the Messiah would come from the family of Judah (Genesis 49:10). Both the Book of Matthew and the Book of Luke reveal the lineage of Jesus, showing Him to be a descendant of Judah (Luke 3:23-38, Matthew 1:1-17). More than a thousand years before Jesus, God promised David He would place one of his descendants on the throne. He said the royal line of David would live on forever and ever (Psalm 132:11-12). Three hundred years later, Jeremiah said God would raise up a righteous king who rules with wisdom from the line of King David (Jeremiah 23:5-6, 33:15). Both of these prophecies refer to the Messiah, and once again, both the Book of Matthew and the Book of Luke confirm Jesus is a descendant of King David (Luke 1:32-33, Matthew 1:1-17). 4) Great Kings Will Present Him with Gifts - A thousand years before the birth of Jesus, Solomon predicted the Western kings of Tarshish and the eastern kings of Sheba and Seba would bestow gifts upon the Messiah (Psalm 72:10). 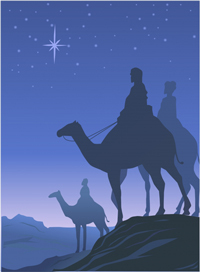 After Jesus was born, wise men from the east followed a star in the sky to Bethlehem. When they arrived and saw Jesus, they bowed down to worship Him. Paying Him homage and tribute, they opened their treasure chests and gave Him gifts of gold, frankincense, and myrrh (Matthew 2:1-2, 11). 5) He Will Be Called Out of Egypt - Seven hundred years before the birth of Jesus, Hosea said the Messiah would be called out of Egypt (Hosea 11:1). Jesus fulfilled this prophecy as well. The Book of Matthew tells us an angel appeared to Joseph and told him to flee to Egypt because King Herod was trying to kill the newborn child. So Joseph, Mary, and Jesus fled to Egypt. After Herod died, the angel once again appeared in Joseph's dream and told him it was safe to take Mary and Jesus back to Israel (Matthew 2:13-20). 6) He Will Bring Light to Galilee - Hundreds of years before the birth of Jesus, Isaiah said a time would come when Galilee of the Gentiles which lies between the Jordan and the sea would be filled with glory. A light would shine for the people who walk in darkness, for a child will be born and His name will be Wonderful Counselor, Mighty God, Everlasting Father, and Prince of Peace (Isaiah 9:1-7). In other words, the Messiah would appear in Galilee. Jesus fulfilled this prophecy too. After leaving Egypt, Jesus grew up in Nazareth. This small town was located in the province of Galilee between the Jordan River and the Mediterranean Sea. Later in life, Jesus began His ministry in Galilee, preaching first in Nazareth and then in Capernaum (Matthew 4:12-17). Today, He is known far and wide as "Wonderful Counselor, Mighty God, Everlasting Father, and Prince of Peace." 7) The Exact Timing of His Birth - During the Babylonian captivity, the angel Gabriel visited the prophet Daniel. He told Daniel precisely 483 years would pass from the time the command is given to rebuild Jerusalem until the Messiah comes (Daniel 9:25). This means the Messiah had to appear at that particular time in history. Did this happen? Yes. According to the Bible, the command to rebuild the Temple was given in 457 B.C. (Ezra 7:11-26). 483 years later brings us to A.D. 27 - the precise moment in time when Jesus began His ministry. No one before or after Jesus could possibly fulfill this prophecy. And history records that Jesus is the only one on earth at that time who fulfilled all the messianic prophecies. This means Jesus is the only one who ever has and ever can fulfill them. In addition, Gabriel said after this time, the Messiah will be killed, "appearing to have accomplished nothing" (Daniel 9:26). This is exactly what happened to Jesus. He was crucified (John 9:18), and at first, it appeared His ministry accomplished nothing. Yet history reveals otherwise. Fulfilled prophecy is evidence Jesus is the Messiah. Is it any wonder Christianity spread so quickly in the first century? Many of those alive in the earliest days of Christianity witnessed the fulfillment of the messianic prophecies (Acts 2:32). This is why Paul used the scriptures as his primary tool for evangelism (Acts 17:2). Remember, the New Testament was not yet a part of the Bible. The scriptures included only the Old Testament. So how did Paul teach about Jesus from the Old Testament? By showing others how Jesus fulfilled the messianic prophecies! Not only was Jesus born at the right time, in the right place, and under the right circumstances - His entire life, from beginning to end, was a fulfillment of prophecy. Jesus gave sight to the blind (Isaiah 35:5-6). He raised the dead (Daniel 12:2). A friend betrayed Him (Psalm 41:9) for the exact sum of 30 pieces of silver (Zechariah 11:12). His enemies pierced His hands and feet (Psalm 22:16) and divided His clothes (Psalm 22:17-18). His friends buried Him in a rich man's tomb (Isaiah 53:9), and three days later, He rose from the dead (Psalm 16:10). The Christmas story is a story of fulfilled prophecy. It's the story of the birth of the savior of the world - our Wonderful Counselor, Mighty God, Everlasting Father, and Prince of Peace.